Only a month late – not bad considering our usual dismal tardiness – we celebrate the 300th anniversary of the birth of Maria Theresia on 13 May 1717, Empress of the Holy Roman Empire from 1740 to her death in 1780. 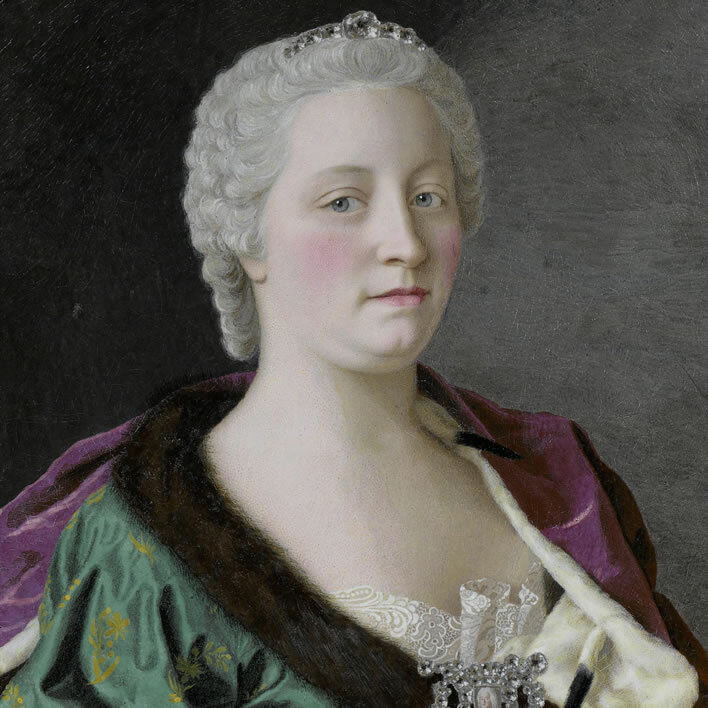 Those who do not know much about Maria Theresia – and that means almost all the English-speaking world – will already be hovering their cursors over the next bookmark in their list. Have no fear: we have neither the time nor the energy for a worthy biographical tribute either. But to mark this big round anniversary let's attempt a brief summary of why she should be remembered. Her achievements were enormous, her influence and the reverence of her lasted well over a century after her death and is still present among the citizens of Austria. The start of her reign was nasty, brutal and very nearly short. Her father, Karl VI (1685-1740), had failed in that first requirement of a dynast: the production of a male heir. Most of his dreary reign of 29 years was therefore spent trying to work out an agreement that would allow his eldest daughter, Maria Theresia, to accede to the throne. During this period the development of the Holy Roman Empire effectively came to a standstill while Karl VI occupied himself 'collecting signatures' for what was known as the 'Pragmatic Sanction'. Getting the princelings and crowned heads of Europe to sign his piece of paper came at a considerable cost to the Empire: he had to persuade them to forego the pickings they might receive if the Habsburg dynasty were to be broken up. In effect he had to buy them off, either with territory or promises of military assistance. When Karl VI died in October 1740, Maria Theresia inherited an empire that was close to ruin. The Pragmatic Sanction fell apart within months. The 'Cannibals of Europe', as Thomas Jefferson would call them 82 years later in a letter to John Adams, smelled rich pickings from this soon-to-be carcass. At the beginning of her reign, the Holy Roman Empire would come to the verge of extinction. The legendary Habsburg progenitor Rudolph I had faced an equivalent challenge on his accession as Holy Roman Emperor in 1273. He saved the empire by energy, ruthlessness and extreme violence when required. [I was lacking] the experience and knowledge required for the governance of such complex and widely spread countries, since my father had never chosen to involve me in or inform me of the external or internal affairs: at one stroke I was devoid of money, troops and counsel. [...] I resolved not to hide my ignorance, but instead to interview each department and inform myself fully. The cannibals fell upon the Empire and upon each other. This young innocent soon found herself in the midst of the War of the Austrian Succession, which lasted eight years and cost many, many thousands of lives and resulted in an enormous loss of resources for all the participants. Her empire survived. True, it had lost most of the valuable territory of Silesia to the Prussians – a loss that would rankle for the rest of her days – but the Habsburg Empire survived. Overlooking all the individual sacrifices of the dead and mutilated, it survived because of her. She had two outstanding characteristics: firstly, determination – an immense toughness and resilience in the face of adversity – and secondly, skill combined with great emotional intelligence in choosing and directing those around her. What an endless carping ['Grillen' – the chirping of grasshoppers], why such faces? Speech is needed, but not just to dishearten the poor queen further, but to help and advise her! without money, without credit, without an army, myself without experience or knowledge and ultimately without any counsel at all, because every counsellor is just waiting to see how things turn out. She replaced the inherited grasshoppers with her own choices – and she chose well. Jean-Étienne Liotard, Maria Theresia, 1747. The thirty year-old Empress painted shortly before the end of the War of the Austrian Succession. Image Rijksmuseum, Amsterdam. The extent of the decay in the Austrian Empire was exposed in the conflicts with Prussia during the war. She hated Friedrich II of Prussia with a will. He had, however, taught her a very important lesson, one that would guide her thoughts and actions during the rest of her reign: the Austrian Empire was a primitive state compared with Prussia, Britain and France. With her new ministers she was able to begin the reform of the convoluted Holy Roman Empire. As a direct result of her leadership the Empire, and particularly its Austrian core, began the long journey from being a debt-ridden, rickety feudal relic to becoming a modern state. After a while even the Hohenzollern Friedrich II reworked his biting mockery of the Habsburg dynasty in her favour: 'At last the Habsburgs have a man, and he is a woman'. Let us be clear: the historical tradition of seeing her son, Joseph II, as the great reformer of the Austrian Empire, mainly because that is what he announced himself to be, is misguided. His ten years of madcap 'enlightenment reform' brought the Empire to the edge of destruction. In reality it was his mother who laid the ground for the albeit hesitant progress of the Empire from a backward, feudal, agrarian shambles to something approaching a modern state – or, more precisely, the principals were the thoughtful people she had the good sense to appoint as her ministers. Whilst she was doing this she produced 16 children, ten of whom survived her, thus settling the Habsburg succession for the next two generations. Grumpy historians can fill many volumes with lists of her character flaws: she was outrageously spendthrift; she was bigotedly Catholic, hating and persecuting Protestants and Jews; she idolised and indulged her eldest son Joseph, but at least managed to keep the worst excesses of his batty temperament more or less under control until her death. She was a bossy bigot (her 'Chastity Commission', for example) and a fussy mercantilist. She became fat almost to the point of immobility. And so on and so forth. But there was a third characteristic that we must not neglect: she inspired affection, loyalty and even devotion. She became the Mater Austriae, the 'Mother of Austria', a living symbol of the people, and arguably has remained so until this day. She brought out the cavalier in her male subjects and an identification as a woman and mother in her female subjects. Historians are not immune from such things, either. The Marxists among them may prefer to write about the suffering of the common people in this feudal state – and in doing so they are not wrong – but the cavalier historians point with justification to the immense unifying effects of her existence and the genuine affection that all levels of her people felt towards her. As to her character, what better person to have as a witness than Goethe! He was an eyewitness at the coronation as Holy Roman Emperor of her husband, Franz Stephan, that took place in Goethe's home town of Frankfurt on 13 September 1745. At the time of the coronation Maria Theresia was 28, had been married to Franz Stephan for nine years and the couple had already produced seven children, four of them still living – and most importantly, male successors. Maria Theresia was welcomed in Frankfurt with jubilation […] The procession began and what may have been missing in completeness and magnificence [only four of the nine Prince-Electors attended] was more than made up for by the presence of this beautiful woman. She stood on the balcony […] and greeted the arrival of her husband with calls of 'vivat' and with applause. The crowd joined in with great enthusiasm. Unlike the usual loveless dynastic pairings, Maria Theresia and Franz Stephan had known each other since childhood and had a warm and loving relationship that lasted through their entire 29-year marriage until the grim reaper took Franz Stephan in 1765. Her husband was not a paragon of conjugal fidelity, to put it mildly, which upset her desperately. But in this way, too, the relationship demonstrated its strength. Maria Theresia, although expecting another baby, attended the coronation of her husband in person. She arrived in Aschaffenburg and took a yacht from there to travel [about 40 km down the River Main] to Frankfurt. Her husband Franz, in Heidelberg [about 120 km overland from Aschaffenburg], wanted to meet up with his wife, except that he arrived too late; she had already set off. Without ceremony he jumped into a dinghy, raced after her, caught her boat up and the loving pair were rewarded with this unexpected meeting. The story of this fairy-tale meeting spread immediately and the whole world felt for this couple, blessed with so many children and yet still so inseparable since their marriage day. Jean-Étienne Liotard, Maria Theresia, 1762. The forty-five year-old Empress. Image Rijksmuseum, Amsterdam. 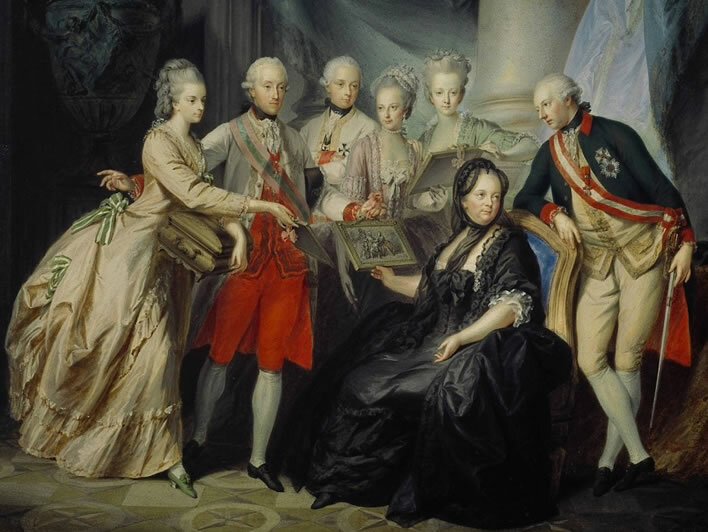 Maria Theresia was a turning point in the Habsburger dynasty: a female empress who disposed of much of the ceremonial clutter and overblown etiquette that had embellished the male line before her. Although always aware of her position – she never risked belittling her rank by affecting the common touch – she had a natural, maternal spontaneity that everyone noticed, an easy commerce with all her subjects. An important factor, too, is that in her everyday life she was a vigorous speaker of the Viennese dialect, the true language of her Austrian people. 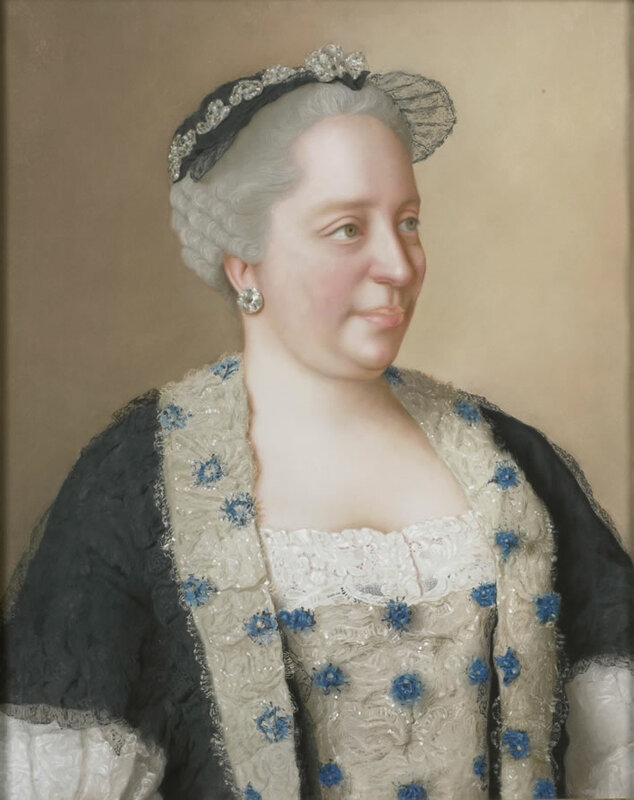 Caroline Pichler, whose mother was one of Maria Theresia's ladies-in-waiting, tells us in her memoirs that her mother had to help out a new German chambermaid, who had trouble understanding what the Empress was saying to her. She was, despite all her majesty, most definitely one of them, her Austrian people. Maria Theresia, extraordinarily beautiful, watched the celebrations from the balcony window […] When her husband, wearing the peculiar [imperial] robes, re-emerged from the cathedral, looking like the ghost of Charlemagne, he jokingly raised raised both hands to show her the imperial orb, the sceptre and the wondrous gloves, at which she burst out laughing – which in turn gave great pleasure to the watching crowd to be able to see the good and natural relationship of the first couple of Christendom. Then the Empress responded by waving a handkerchief and herself shouted a loud 'vivat'. The jubilation and enthusiasm of the crowd knew no bounds and the shouts of joy seemed to go on forever. A document in the Viennese 'Haus-, Hof- und Staatsarchiv' illustrates perhaps better than all eulogies the essence of this unusual woman, as well as the difference between her and her Habsburg predecessors. Once, as she was drinking her morning coffee and reading government documents, dunking her biscuit in the time-honoured Viennese manner, she dripped coffee onto a document. With her pen she circled the stain, then added a note to the effect that she was very ashamed that she had caused this mark. 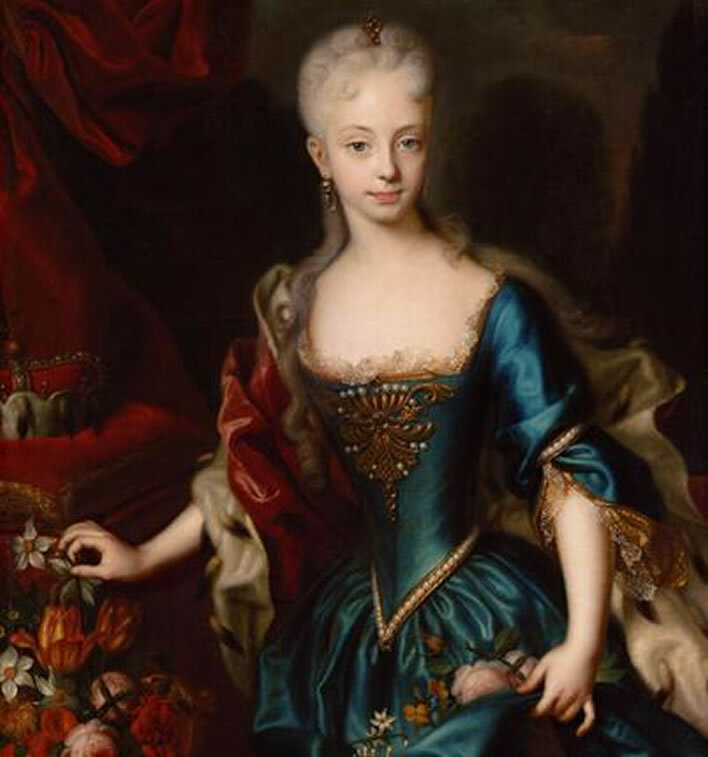 Maria Theresia was the first Habsburg in a long while who could be seen as a human being by her people. Goethe has already supplied us with the evidence that this was so. Maria Theresia and her husband were not only visible but observably human. They played roles – wife and husband, mother and father – with which their subjects could immediately relate. There are many anecdotes of her to this effect. She was undoubtedly loved and respected by her people. Friedrich Heinrich Füger (1751-1818), Erzherzogin Marie Christine und Herzog Albert von Sachsen Teschen präsentieren der Familie Bilder von den Verwandten in Italien: Kaiserin Maria Theresia im Kreise ihrer Kinder, 1776. Image: Österreichische Galerie Belvedere, Wien. We have considered her beginnings as ruler – what about her end? Her last years were not happy ones for Maria Theresia. A key witness to that time is her second son, Leopold, who would suceeed his brother Joseph II as Holy Roman Emperor in 1790. On his mother's orders Leopold travelled to Vienna from Tuscany in the late summer of 1778. To Leopold's extreme frustration he was stuck there until March of the following year. He confided his innermost thoughts to a journal he wrote during his stay. The journal also has 96 appendices, mostly collections of documents that had been given to him during his stay. The first of these appendices is very private indeed: it is written in a complex secret shorthand and is titled Stato della famiglia, 'State of the family'. In this 50 page document Leopold discussed the characters of most of the members of his family who lived in Vienna. It is a document full of bitterness. Even if only a half of the description that Leopold entrusts to his status report is accurate it is clear that Maria Theresia is no longer the woman who ascended the throne nearly 40 years before, who faced down the militarist arch-enemy Friedrich II of Prussia, who cleared out the moribund administration and rescued the bankrupt state left by her father and who, whilst doing this, produced 16 children and guaranteed at least the immediate succession. Her beloved husband Franz Stephan – the rogue! – had been dead more than a dozen years now and the spark in her life had been extinguished with him. Also since that moment her rule had been shared with her impetuous oldest son Joseph as Co-Regent. In 1778/9, when Leopold was in Vienna, she was in her early sixties and feeling and showing her age. She had barely a year to live. She was by that time extremely overweight, her breathing was difficult and walking, particularly up stairs, became ever more so. Leopold notes how ashamed of her decrepitude and annoyed with herself she was. Her memory was weakening: she would repeat the same orders to different people or countermand her own orders, confusing everyone. She was hard of hearing, which was also a cause of shame and confusion. Her lifelong piety grew ever more consuming. She attended two masses a day, one after the other, took her lunch alone and spent her free time in prayer and meditation. She withdrew into herself, spent much time alone or with the ladies of her chamber and only ventured out to visit a church or a convent. Leopold describes her as almost continously alone and melancholic, never happy about anything and paranoid, distrusting herself and everyone else. She was never in social company and was permanently disenchanted with everything. She thought that her life had been a failure in that nothing she had started had been finished off. The empire and its morals were going to the dogs. Her drive had gone: she was weak, had lost all her courage and fortitude, was tortured by regrets and just wanted to be alone. Her character at this time is almost completely defined through the unremitting conflict with her son, the Emperor Joseph. She was old and tired; Joseph was 37 and restless to get his name into the history books – which he would ultimately do, but not in a way he expected. She kept threatening to retire and let him get on with ruling on his own, but the threats were empty ones. Habsburgs don't resign. Her relationship with Joseph is worthy of any Viennese psychiatrist's couch. She idolized him, adored him, was delighted for him whenever he did anything that gained acclamation or praise (this is the jealous second son writing, don't forget). Conversely she was devastated when something happened that dented his public image, she was desperate to find an excuse for him and extremely depressed if he was not viewed by the public as the great man she herself thought he was. At the same time there is a continuous war of attrition between mother and son: she wanted to order him about, to control his actions and she expected to be told everything about what he did and whom he met. When they were together there were unending arguments. She complained about him almost to anyone who would listen, as he did about her. The entire court followed their trench-warfare and took sides as appropriate. She frequently expressed feelings of hurt – her best weapon in the war – if Joseph did things, even trival things, without informing her. In state business she let everything slide, according to the administration specialist Leopold, just doing what she was bidden to do, except, of course, when she decided to get involved and meddle in affairs that she would otherwise have ignored. She would leave official papers and letters lying around in her room that were read by servants and which would then become the subject of gossip and cause more trouble when the news got back to Joseph. After a dozen years of trench-warfare with 'Joseph-the-always-right' we can fully understand her apathy during those last years. 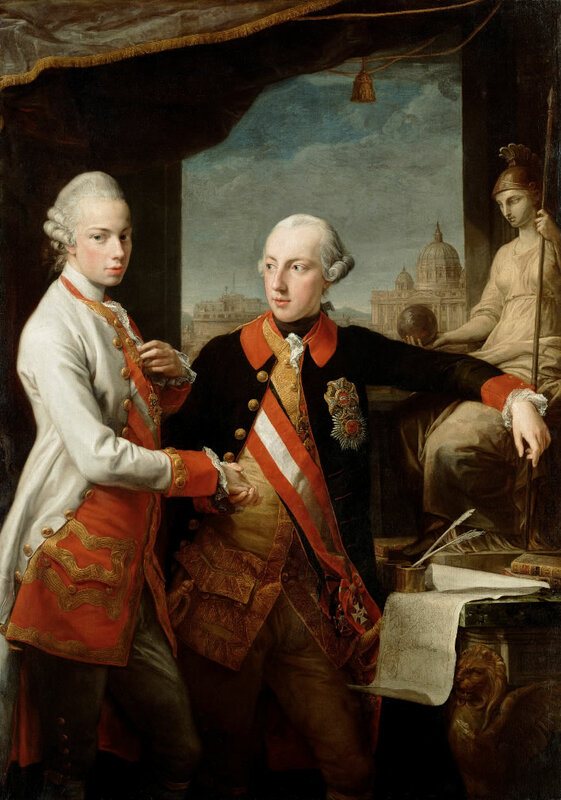 Leopold and Joseph in a sensational double portrait from 1769, paid for by their mother. The harmony was only on canvas. Pompeo Batoni: Kaiser Joseph II. (1741-1790) und Großherzog Pietro Leopoldo von Toskana (1747-1792), dated 1769, Image: Kunsthistorisches Museum Wien, Gemäldegalerie. 'Now let they servant depart in peace, Lord'. For His pious handmaid Maria Theresia it was not to be an easy departure: the two masses a day she had attended in recent times appear to have had little effect. Perhaps without them the departure might have been even worse, but it was quite bad enough. The greatest of her torments was her breathing, which her contemporaries would ascribe to the 'Viennese Lung'. The Viennese, always delighted with every confirmation of the exceptionalism of their wonderful city, adopted the disease Viennese Lung with an unhealthy enthusiasm. The disease was held to be due at least in part to the 'dust plague' that visited the city in summer, when the clay, sand and grit of the roads was ground up fine and sprayed into the air by the millwheels of the passing carriages. Under this theory every Viennese resident was effectively a quarry worker or miner. Vienna wasn't the only city at the time with high mortality rates of lung disease, but here the dust plague and the Viennese Lung were branded as Viennese, much as waltzes would be later. Thus the Viennese Empress died a Viennese death. For a long time she had been troubled by breathing difficulties and persistent hot flushes, but in her final six weeks the Viennese Lung took control of her life, reaching a crescendo from the middle of November 1780 until she died on the 29th. She was plagued by prolonged coughing fits, accompanied by bouts of suffocation panic. She could not lie down with ease: that would have been like a drowning person lying down on the seabed. Instead she sat more or less upright for the rest of her days, waking and sleeping, in an effort to keep her head above the waters of the Viennese Lung. Just moving her arms could be sufficient to trigger an attack. Some days were better, some days were bad. She would ask her doctor and her priest how long this torment would go on. They, themselves helpless, counselled patience and fortitude but otherwise could do nothing for her. Maria Theresia's last words, if we know them correctly, reflect her personality. They are without intellectual reach but nicely down-to-earth. In what would be the last of her frequent changes of sitting position to keep her head above the waters of the Viennese Lung she settled down awkwardly on a chaise-longue. Joseph asked whether her position wasn't uncomfortable. 'Yes', she replied, 'but good enough to die in'. She took three or four more breaths, then she was gone and the empire slipped from the arms of its mother into the full possession of Joseph the Mad (unfortunately a much earlier Spanish Habsburg claimed that soubriquet first: the much missed 'Johanna the Mad'). Joseph was sobbing over the body in a display of inconsolable grief, a speciality of his. Who best to know a son than his mother? Maria Theresia had foreseen this moment and had explicitly instructed her doctor a few hours before her death to close her eyelids himself because 'it would be too much to ask of the Emperor'. She was a Habsburg through and through in death as well as in life and so continued the family's bizarre practice of dismembering its dead emperors. 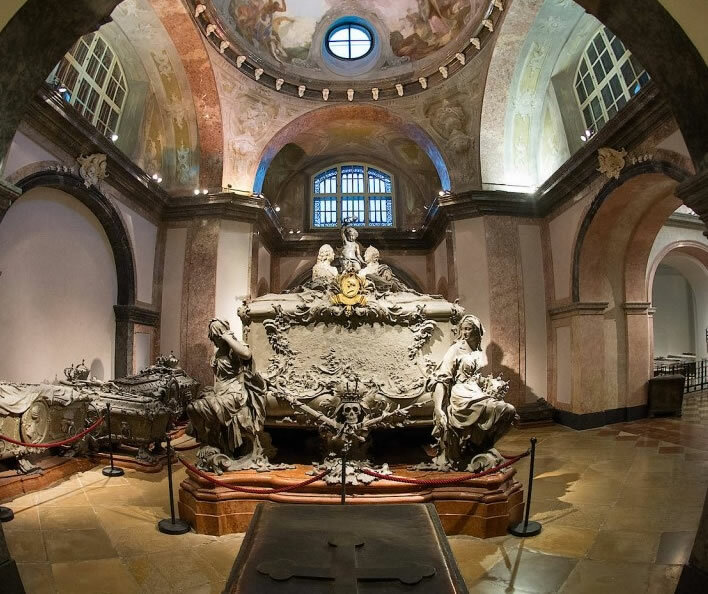 Consequently, parts of her are distributed around Vienna: Her embalmed body rests alongside her beloved Franz Stephan in the roccoco extravagance of their tomb in the Imperial Crypt of the Capuchin Church, her heart is in the Loreto Chapel – the Herzgruft – in the Augustinian Church and her viscera in the 'Ducal Crypt' in St. Stephen's Cathedral. There was a lot of Maria Theresia. Most of it is in her tomb in Imperial Crypt of the Capuchin Church in Vienna, side by side with her beloved Franz Stephan. Joseph's enlightened tin-box is in front of it. All in all a life well lived. A life of highlights and shadows, which in its great significance demands reassessment in every generation. To Cavaliers she is a great mother of her nation; to Marxists a despot; to Feminists an icon (sort of); to Jews an antisemite; to Protestants a Counter-Reformation monster. Perhaps the old warmonger Friedrich II was right: she was a man when so many weren't. Denkschrift Müller, Rainer A., ed. 'Der Zustand der Habsburgmonarchie zu Beginn der Herrschaft Maria Theresias von Österreich (1750/51)' in Deutsche Geschichte in Quellen Und Darstellung. Stuttgart: Reclam, 1995. Universal-Bibliothek Nr. 17001. p. 339-355. Dichtung Goethe, Johann Wolfgang von, and Walter Hettche. Aus meinem Leben. Dichtung und Wahrheit, 'From my Life. Invention and Truth' (c. 1811–1833). Durchges. und bibliogr. erg. Ausg. Stuttgart: Reclam, 2012. Wandruska Wandruszka, Adam. Das Haus Habsburg: Die Geschichte einer europäischen Dynastie, Friedrich Vorwerk Verlag, Stuttgart, 1956.